Won't You Be My Nabor: Pumpkins, Pumpkins, Pumpkins! Tonight I have been making some Pumpkin Butter! I didn't even know there was such a thing till last week when I discovered it on a blog. I know all about Apple Butter because my Dad loves it, but had never heard of Pumpkin butter. So I am giving it a try. I posted that I was making it on my facebook page then my boss left me a comment saying "You're bringing some to the office, right? =)" So now that's what I am doing. Think I will get up a little early and put some biscuits in the oven to take too. I just hope it's good. It's my first time making it so we shall see. If it is good I will share the recipe! Now for our pumpkin! We carved our pumpkin the other night so we would have to sit on our porch for Halloween. I have some cute pics of us carving our pumpkins, but for now I will just show you the finished product! Last year we did an "N" pumpkin, for Nabors and I loved it so much I decided that we will do it every year. I know one day when we have kids we will have to do something a little more fun like a face or something, but for now I like our "N."
Hubby did such a good job carving it too!! After he was all done, we put a candle in it and tested it out. I put it on our kitchen table for us to enjoy inside then knew it would be going out on the porch Halloween night. I think it turned out awfully cute if I do say so myself!! So that's all for now! I will post more pics later of our fun night carving pumpkins with friends AND my work Halloween costume I came up with. It only cost me $13 too! Oh my gosh, you are so creative, I loooove it!!! a) Pumpkin butter sounds AMAZING! Was it easy to make? b) your pumpkin display is A-DORABLE! 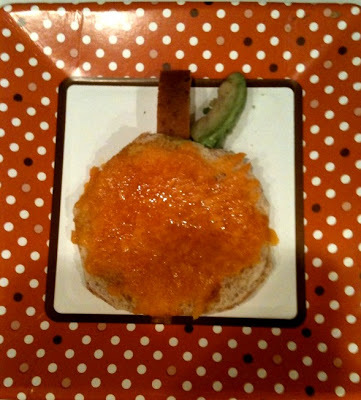 c) Cheese toast pumpkin? Are you serious? And with avocado? I'm dying over all this cute-ness! Love your pumpkin! And that cheese toast pumpkin is adorable! Stop it! You are TOO creative and cute! Pumpkin looks fab, as does all the decor around it, too!!! Your N pumpkin looks great! Hope Y'all had a great Halloween! Hey Lindsey! Your comment on my blog made my day!!! Thank you sooooo much! I am most definitely going to do that... it's worth a shot! :) Also, you are just adorable... you never cease to amaze me with your cute posts! This pumpkin is awesome - so original! Wow! That came out awesome. He definitely has some carving skills. What a creative centerpiece- I wish I'd thought of that.